When the contacts of a circuit breaker are separated, there is a luminous electric discharge between these two contacts known as ‘Arc’. This arc may continue until the discharge ceases. The production of arc may delay the current interruption process and generate emormous heat which may cause serious damage to system or to circuit breaker itself. Therefore, the main problem in a circuit breaker is to extinguish the arc within the shortest possible time. When a fault occurs a heavy current flows through the contact of circuit breaker. When the contacts begin to separate, the contacts area decreases rapidly which causes high increases in fault current density and hence rise in temperature. When the contacts are separate, a protential difference is created between them. If the voltage between contacts is more than dielectric strength of medium between contacts (usually the medium is air or oil), it may sufficient to ionise the medium between contacts. The ionised air or vapour act as a conducting path and hence the arc is structed between contacts. The voltage that appears across the contact of circuit breaker during arcing periods is called Arc voltage. The arc between contacts act as conductor and persist a resistance value known as arc resistance. Current flowing between the contacts depend on the earth resistance. – Greater the arc resistance, smaller the current that flows between contacts. 1. Degree of ionisation: As the ionised particle between contacts is decreases, the arc resistance increases. 2. Length of arc: As the separation between contact increases, the length of arc also increases which results in increase in arc resistance. 3. Cross section area of arc: The earth resistance increases with the decrease in area of cross section of the arc. 1. Potential difference between contacts: When the contacts have small separation, then the potential difference between them is sufficient to maintain the arc. 2. The ionised particles between contacts: The ionised particles between contacts act as charge carriers and offers conducting the path. As we have discussed above that potential difference between contacts and ionised particles between contacts are responsible for maintaining arc. Therefore there are two way to extinguish the arc between the contacts. First way is to separate the contacts to such a distance that potential difference becomes insufficient to maintain the arc. However, this method is impossible in higher voltage system where a separation of many meters may be required. Second way to extinguish the arc between contact may achieved by cooling the arc by removing the arc particle from the space between contacts. There are two methods of extinguishing the arc in circuit breaker. These are high resistance methods and low resistance or zero resistance method. In this method, the arc resistance is increases gradually so that current is reduced to such a value that heat is insufficient to maintain the arc. 1. Lengthimg the arc: As length of arc increases, the arc resistance also increases. The length of arc can be increased by increasing the gap between contacts. 2. Cooling of arc: Cooling help in de-ionisation of the medium between the contacts. This increases the arc resistance and remove the heat from arc. 3. Reducing cross sectional area of arc: By reducing the cross section area of arc the voltage necessary to maintain the arc is increased. This can done by allowing the arc pass through the similar area compared to wide area. 4. Splitting of Arc: The resistance of the arc can be increased by splitting the arc into a number arc in series. These may be split by introducing some conducting plates between the contacts of circuit breaker. The major disadvantages in this method is that is very high energy is dissipates in the arc. Therefore, it is the employed only in dc circuit breaker and low capacity is ac circuit breaker. This method is applicable only in ac circuit breaker because ac has natural zero of current. As we discussed that the arc at as a conducting path it means it offers low resistance. 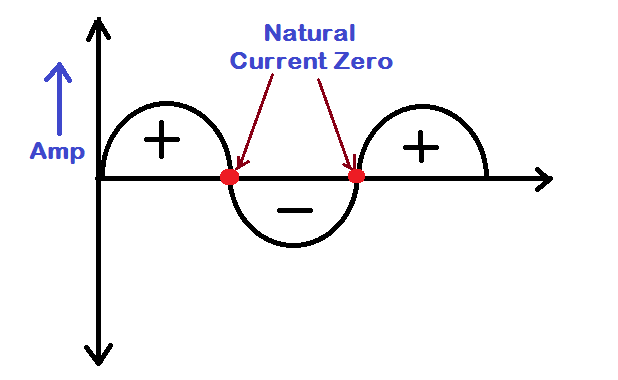 In this method the arc resistance is kept low until the current magnitude become zero (natural zero) because at every current zero arc extinguishes for a short period. As the medium (air or oil) between contacts contain ionised particles so it has small dielectric strength. Therefore ionised air can easily breakdown by the contact voltage and arc will persist for another half cycle. 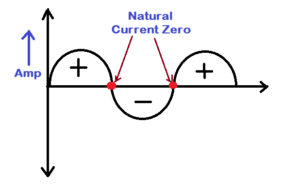 The voltage that appear across the contacts at current zero during arcing period is called is re-striking voltage. As we discussed there is natural zero in ac. At every current zero, the arc is extinguishes for a short period. Within this time period, if the dielectric strength of medium between contact is the increases to such a value that voltage across the contact become insufficient to breakdown the space between contacts, then arc fail to re-strike and the current will interrupted. 1. Causing the ionised particles in the space between contact to recombine into neutral molecule. Ionised particles are responsible to carry current and reduced dielectric strength of medium. When ionised particles are recombine, the dielectric strength of medium increases. 2. Sweeping the ionised particles away and replace them by unionised particles. If the ionised particles of medium between contacts are replaced with fresh particles, the dielectric strength of the medium between contact is increased. Therefore, the air fails to the strikes and flow of current is interrupted. – Lenthing of the gap: Dielectric strength of the medium can be increased by increasing the length of gap between contacts. – High pressure: More the pressure of medium between contacts higher the density of particles. The increased density of the particles causes higher rate of de-ionisation and hence the dielectric strength of medium between contacts increases. – Cooling: Cooling causes ionised particles in the space between contacts to recombine into neutral molecule. This increases the dielectric strength of the medium. – Bast effect: In this process the ionised particle between contacts are swept away and replaced by fresh unionised particles. This increases the dielectric strength of the medium and hence arc fails to re-strike.